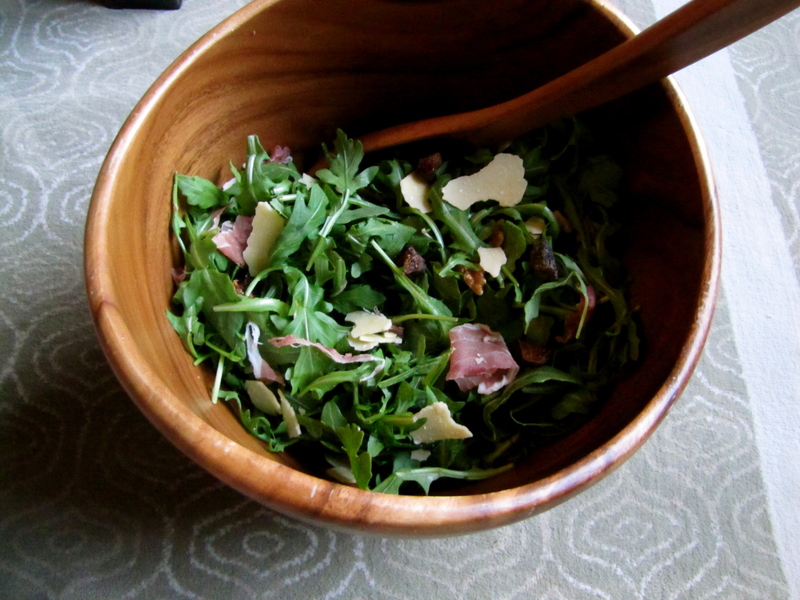 Arugula Salad with Fig, Prosciutto, Walnuts and Parmesan – Voila! The holidays are almost over and we’re all looking forward to the day when there are no more tins of cookies and brownies and sweets lying around the house. It’s quite possibly the one time of year in which we are so tired of desserts, we never crave them. We actually crave light, fresh fare! So to help ease the transition from the nonstop butter attack to a healthier lunch or dinner item, feast on this delicious salad! It’s savory, slightly sweet with figs (I admit, it’s hard to stop sweets cold turkey – start with some dried fruit) and a little salty with the prosciutto. Perfect combo. Happy New Year! 1. Place arugula in salad bowl. Sprinkle the rest of the ingredients into the bowl. Mix with dressing and serve. I can vouch for the delicious-ness of this salad! thanks Emily! Love love love! Agreed about the sweet overload. Josh and I have decided to instigate “Salad Wednesday” and this is definitely on the menu! I like the idea of salad Wednesday! Nicely done!